Sunnyvale, Calif.—June 11, 2013— Vitria Technology, Inc., The Operational Intelligence Company, today announced that O2, the commercial brand of Telefónica UK, will present its use of continuous, real-time Operational Intelligence to delight customers at Big Data Analytics 2013. The conference, led by Whitehall Media, will be held on June 20th at the Hotel Russell in central London, UK. Mr. David Akeroyd, Head of Operations Support Systems Architecture at Telefónica UK and Mr. Adrian Pasciuta, Director of Industry Solutions at Vitria will discuss how customer-centric companies can leverage an Operational Intelligence platform to gain deep insight into customer issues and proactively respond to and convert these issues into opportunities to delight customers. Mr. Akeroyd and Mr. Pasciuta will outline how O2 uses Operational Intelligence for continuous insight into the customer experience by combining and correlating high-volume, high-rate network events with customer data and mobile device data, in real-time. They will explain how companies can proactively detect and resolve potential service quality issues and identify new product marketing opportunities, in real-time, by exploiting an Operational Intelligence platform that enables continuous, real-time visibility into Big Data, complex events, and business processes. To schedule a briefing while at Big Data Analytics 2013, please e-mail vitria@schwartzmsl.com. Vitria Technology, Inc. provides the industry’s leading Operational Intelligence platform, empowering partners and customers alike to develop innovative operational intelligence solutions to analyze big data, complex events, and business processes in the proper context and take real-time action. The result is faster, better decision-making. 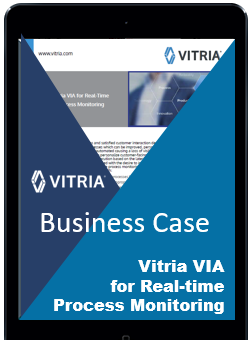 With a rich heritage as a BPM technology pioneer, Vitria’s award-winning process integration solutions provide the backbone for many Global 2000 companies’ mission-critical business processes. Vitria has customers in North America, South America, Europe, Asia and Australia.